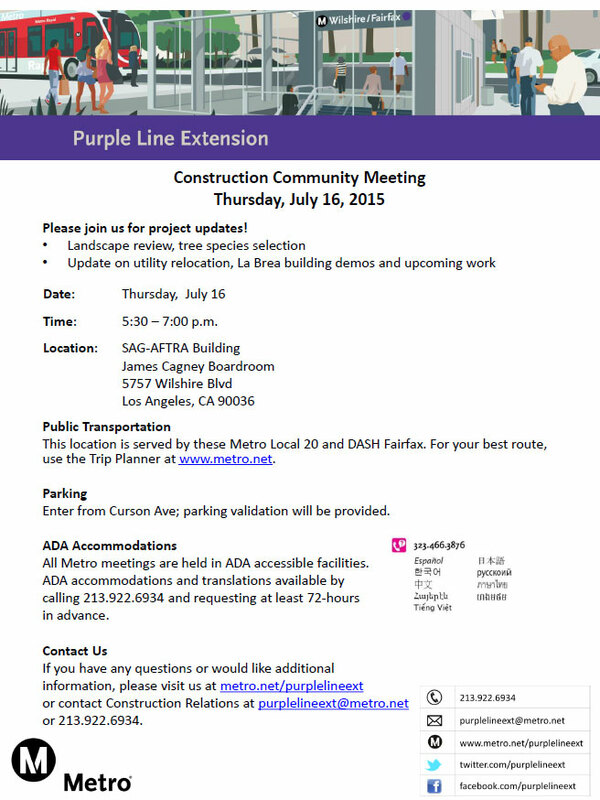 Metro will be holding its next community meeting for the Purple Line Extension Project now under construction at the SAG-AFTRA Buildiing at 5757 Wilshire Boulevard on Thursday, July 16. The team will be discussing advance utility relocation updates, the staging yard at Wilshire/La Brea now being built, and an overview and schedule for Metro’s planned pile drilling operation later this year to excavate the Wilshire/La Brea subway station box. The community relations team will also present a landscape palette review for replanting trees and greenery when the project is complete, and will update community members on Metro’s Eat, Shop, Play Wilshire campaign. Lastly, the team will present Metro’s draft plan for replacement parking. Why is Metro providing parking validation for this event? Will you be providing free bus fare as well? Stop subsidizing the competition!